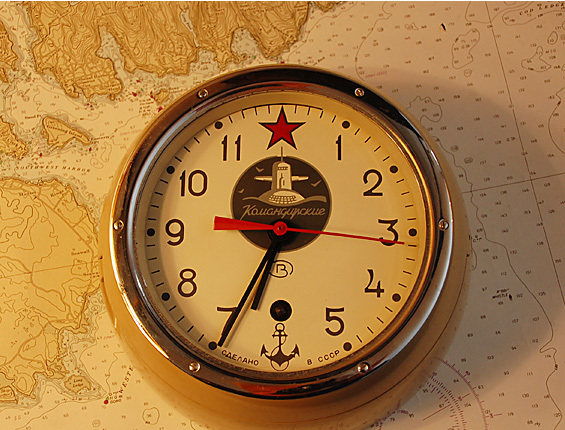 We are offering a Russian submarine wall clock. The body is made of metal and the face is protected by thick glass and a rubber gasket. The clock weighs 6 lbs. 3 oz. The face measures 5-1/2" and the base 8 ½” in diameter and it is about 3-1/2" deep. 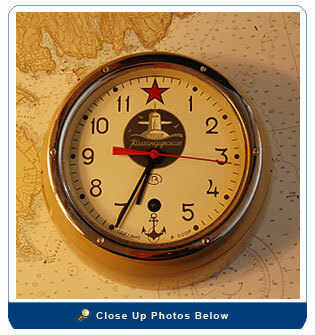 On the face is an image of a nuclear submarine (I would not think the clock is not that old because of the modern submarine image… probably was made the late 60ties). A star replaces the hour 12 and an anchor replaces the hour 6. Under the submarine is written "KAUAHGUPCKUE" and long the bottom of the face is written " CAEAAHO/B CCCP". The clock keeps perfect time (there is an adjustment on the top of the face for slow and faster – see in pictures) and there is a key included. The key opens the clock on the right side and winds the clock (see pictures). The clock has a 12-jewel movement and runs for 8 days on one winding. This clock is in very good condition and keeps perfect time… thus, we offering an unconditional satisfaction guarantee with it.